Aeolian is a five-piece metal band hailing from Palma de Mallorca, Spain, currently consisting of vocalist Daniel Perez, guitarists Raúl Morán and Gabi Escalas, bassist Toni Mainez and drummer Alberto Barrientos. Initially a one-man project started in 2016 by Raúl Aeolian quickly turned into a full-blown band when Alberto, Dani and Gabi joined after Raúl finished writing and composing the majority of the songs for what is going to be the band’s maiden release. Toni joined later, the songs’ recorded bass lines were played by project bassist Santiago Gil. Now, roughly a year later, the band finished the work on its first ever release, a full-length called Silent Witness. The first notable feature, found without even having heard a single note, is the lyrical concept. Rather than choosing death, disease, violence and other types of misery, the band tries to create a bit of awareness about the worrisome condition of earth’s environment and the urgent need to protect what is left of it. They wrapped this heavy subject in an equally heavy musical package, mostly build on strong death and black metal influenced tunes. All the ingredients to ensure an epic metal album, provided they have been blended in the right way. The album offers twelve songs, spanning a total playing time of just over 55 minutes. Opener Immensity immediately sets the tone, both lyric- and music-wise. Humanity is accused of being asleep while the earth and its animal inhabitants get poisoned by our waste. Talking about a silent witness… Anyway, if the long, pained scream, perfectly summarizing the band’s view on the subject, ending the song’s intro didn’t wake you up, nothing will. The furious drums accompany said scream also guide the following, somewhat annoyed growls, again perfectly fitting the lyrical theme. Throughout the song the guys continuously, sometimes surprisingly change course from blackened to death to soft string stroking parts, with ditto vocal lines. A promising start indeed. Apparently the guys had the same thoughts, because this changing course is a recurring theme on Silent Witness, be it not as extensive all the time. The rhythm section produces a strong, atmosphere-defining spine, around which the two guitarists spin their raw outbursts, aggressive riffs or refined melodies to form the framework within which the vocalist has to find his perfect path. And does he ever. He effortlessly jumps from reassuring whispers to downright diabolical screams. The frustration, pain, annoyance, anger, fear and even hope is audible in the various vocal parts, regardless the style. Together this combines into predominantly angry sounding songs that clearly reflect the guys’ point of view on the subject of environmental neglect. A great concept, but one that, as the album progresses, loses some of the surprise effect and originality. Nevertheless it still has enough power and vibe to keep things more than interesting. The continuous change of course within the songs keeps demanding your attention, making this an adventurous journey through the many various ways in which we as humans manage to make a huge mess of our earth and its environment. There’s a lesson to be learned here and that’s a plus in my book. Honestly however, regardless your opinion about or concern with environmental neglect, music-wise there’s much to discover and enjoy on this album that I’d recommend every metal fan to give this a fair chance. Whether you prefer the coldness of black metal, the rage of death metal or the metal-on-speed of power metal, to a certain extent it’s all there. 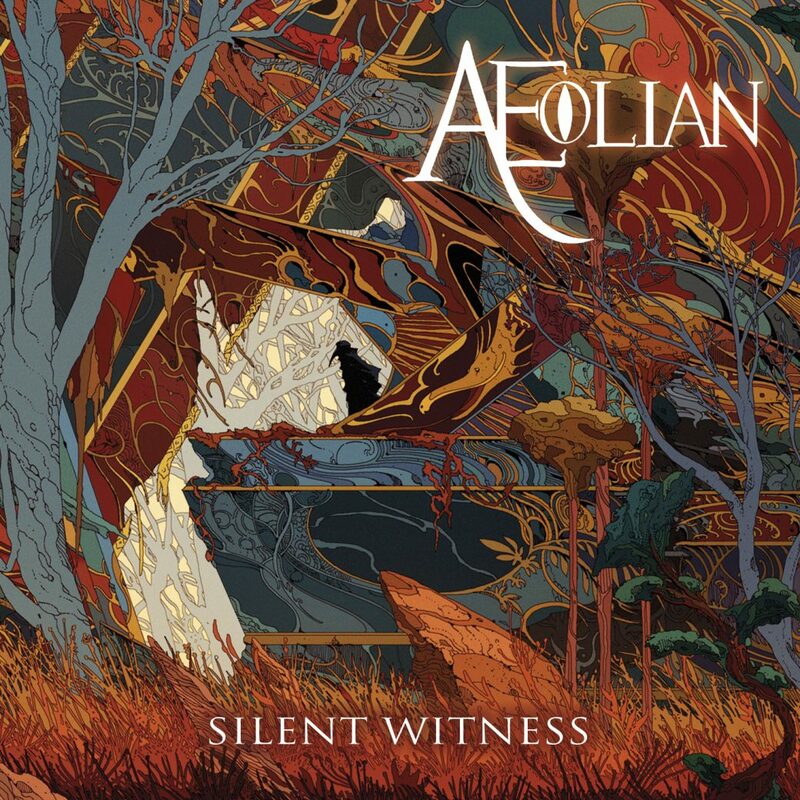 Aeolian is a band with great musicians that piece by piece show great potential and Silent Witness, despite being their debut, sounds very mature and developed. This is a band to keep track of.